This easy to make Beet Gnocchi is as pretty as it gets. 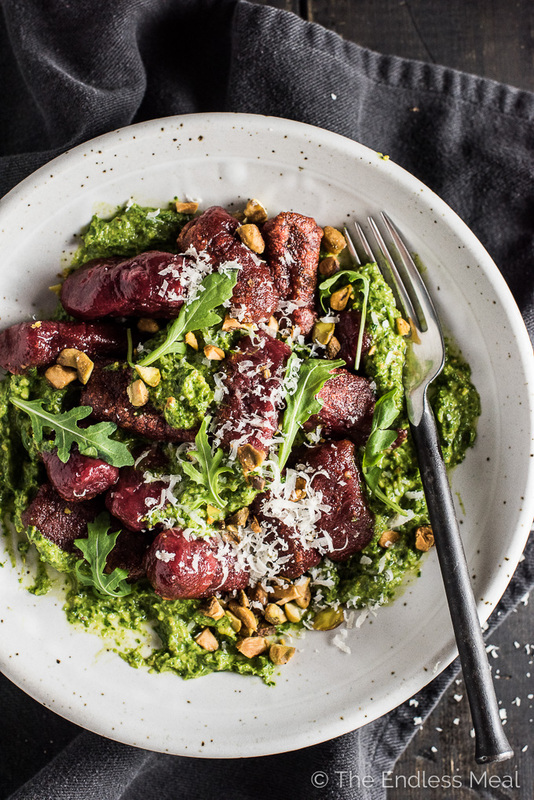 The little red clouds get nestled in some delicious arugula pesto and sprinkled with pistachios. It's festive colored and the perfect main dish recipe for holiday entertaining. Friends! I've been crazy excited to share this post with you all week. I can't stop staring at the red and green Christmas on a plate explosion that's going on here. Can we just hurry up and have ourselves a dinner party, already? It was just a few days ago that I was going on about how much I love this time of year because of all the parties. You guys, I can't help it. I blame it on parties for being so much fun. Ever since I passed the 30 mark (which is getting dangerously far away now) I've been more on Team Dinner Party than Team Crazy Party. You with me? I love planning the menu and getting all the little details just right … the music, the candles, the guest list. I love when it all comes together and we're sitting around the table full of food and laughter with heads fuzzy with wine. It somehow feels both civilized and carefree. I also love that it gives me an excuse to spend a little more time in the kitchen. Most of the recipes here on TEM are the kinds of recipes that I like to make every day. They're recipes that are delicious, but also quick and easy. You know, weekday recipes. 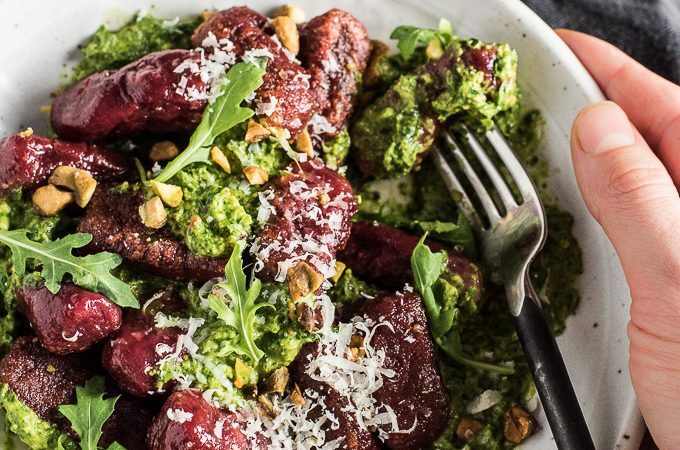 This beet gnocchi recipe isn't difficult, but it's definitely a weekend recipe. You'll want to take your time and enjoy the process … with a glass of wine in hand, of course. I know that the thought of making beet gnocchi might sound a little intimidating, but me trust when I say it's not hard at all. If you can bake a potato, mix batter, and boil water, you can make gnocchi. ♡ Bake a couple potatoes and boil some beets. ♡ Mash the potatoes and blend the beets. ♡ Mix the two together with some flour then roll the dough into a long log. ♡ Slice little gnocchi pillows from the log. I did skip the step about making the pesto, but you get the idea. It's easy! I used my all-time favorite → enter every superlative you can think of ← kitchen tool to make this beet gnocchi. You know what I'm talking about, right? My Vitamix. I LOVE my Vitamix and, ever since I bought one a few years ago, have been desperately trying to convince everyone who will listen to buy their own. People tend to think a Vitamix is only to blend things, but that's only half of what it can do. In this recipe, it pureed the beets till they were as smooth as silk. It also chopped the pesto to the perfect point where it blends together but is still left a little chunky and raw. 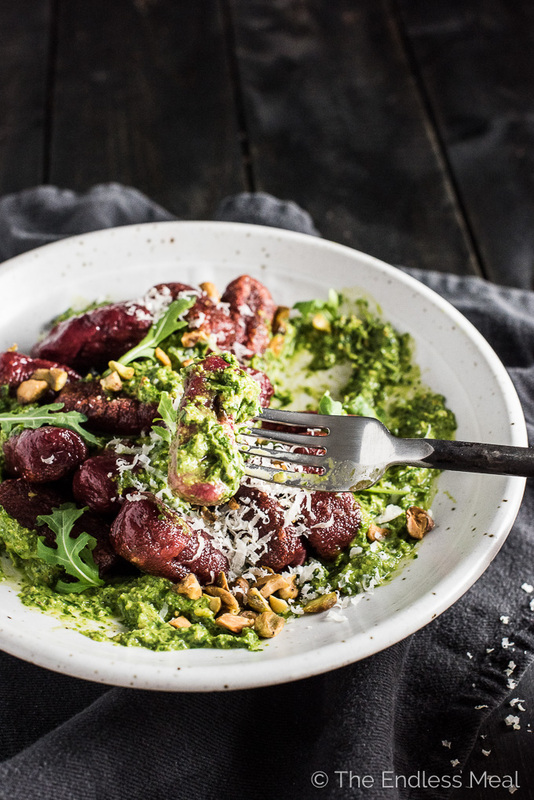 The combination of the feathery light beet gnocchi pillows, the chunky arugula pesto, and the crunchy pistachios is totally where it's at. If you want to create an unforgettable dinner party moment, this is how you do it! 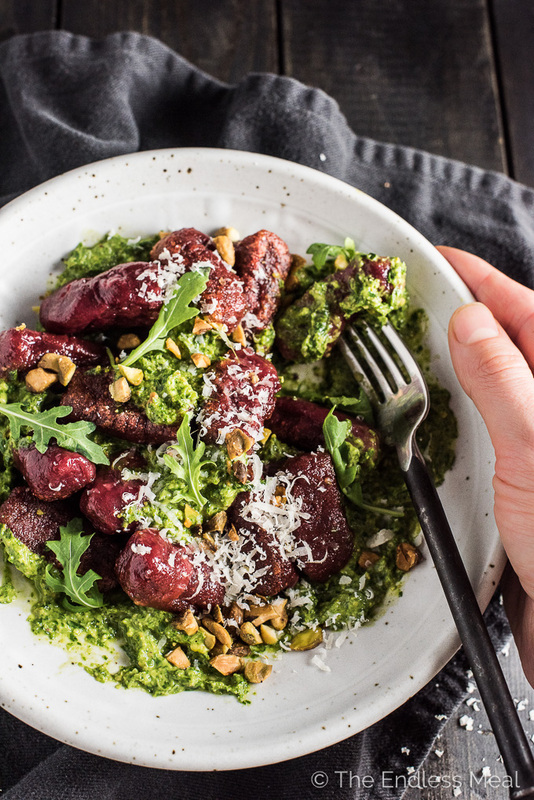 If you make this Pretty Beet Gnocchi with Pistachio Arugula Pesto make sure you snap a pic and tag #theendlessmeal on Instagram so I can like and comment on your photos. I love seeing TEM recipes you create! Preheat your oven to 400 degrees. Place the potatoes on a tray and pop them into your oven. Let them roast until soft, about 1 hour. Remove them from the oven and immediately cut them in half. Working with one half at a time, hold it with a clean kitchen towel and scoop out the flesh with a spoon. Either mash the potatoes with a potato masher or (ideally) squeeze them through a ricer. While the potatoes are roasting, prepare the beets. Chop the beets into 1/2 inch pieces and place them in a pot. Pour about 2 cups of water into the pot and bring it to a boil over high heat. Reduce the heat to medium, cover the pot, and simmer for 20 minutes, or until the beets are soft. Remove the lid and let any remaining water boil off. Place the beets in your Vitamix and blend on high until smooth, using your plunger to keep the beets blending. Pour the pureed beets into the mashed potatoes, sprinkle the salt over top, and mix well. Taste and add more salt, if you'd like. Add the 2 1/2 cups of flour to the bowl and mix into the beets and potatoes. Sprinkle about a 1/4 cup of flour onto your work surface. You'll want some room for this … I find my dining table works best. Dump the gnocchi dough onto the flour and then sprinkle a little on top. Divide the dough into 4 pieces. Roll each piece into a ball, adding more flour to the surface if it becomes sticky. Then roll each piece into a log about 1 inch thick. Using a sharp knife cut the dough into 1-inch pieces. Place the gnocchi onto a parchment lined baking sheet, making sure they don't touch each other. They will stick! Put a large pot of well-salted water on the stove to boil. Make the pesto by placing all of the pesto ingredients into your Vitamix and process on low until combined but still a little chunky. When the water comes to a boil, add the gnocchi and cook until it begins to float, about 3 minutes. Drain well then add the gnocchi back to the pot and pour a little olive oil over top. Shake the pot so the gnocchi are covered in oil. Divide the gnocchi and pesto between 4 plates and, if you'd like, sprinkle on a little extra parmesan cheese. If you'd like, you may fry the gnocchi after you boil it. It's nice when one side is crispy. To fry the gnocchi, heat some olive oil in a non-stick frying pan over medium-high heat and fry on one side until it starts to brown, about 2-3 minutes. OMG! Love this beet gnocchi. Up my food alley 100% need to give this a try. Have you used gluten free flour for this? We made this for dinner last night and it was delicious!! It was the perfect meal for our Christmas dinner party! I’m so happy to hear it was a hit! Hooray!! Super easy and such beautiful color!